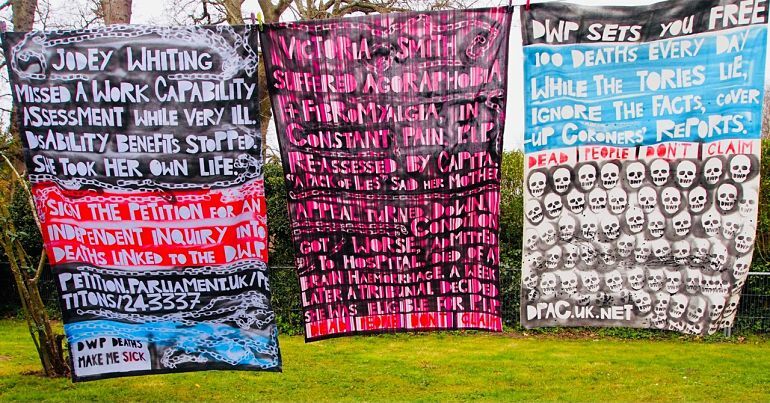 The DWP just lost a humiliating court case. The compensation floodgates are open for thousands. 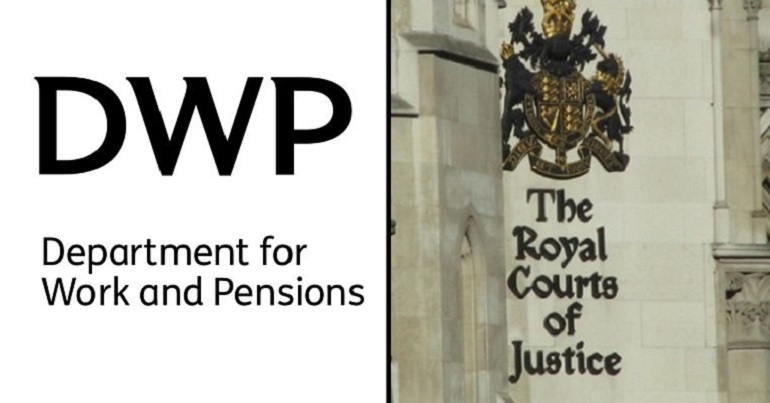 The Department for Work and Pensions (DWP) has just lost part of a major court battle, the first defeat for its controversial Universal Credit reforms. The case could already have implications for up to 15,000 people, who solicitors say should be compensated. The case centred on the loss of benefits for two claimants, known only as TP and AR, when they moved onto Universal Credit. Because this new benefit from the DWP replaces most previous ones, some disabled people with severe impairments could lose out on money. 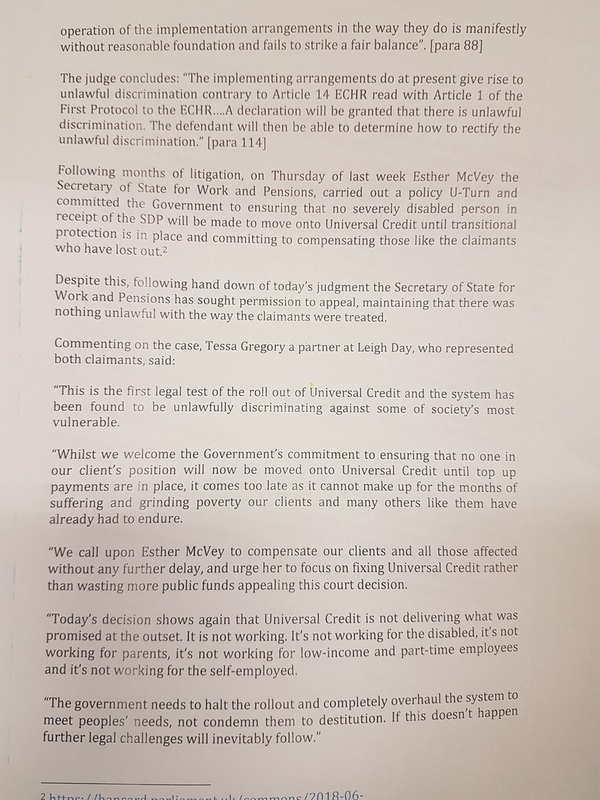 Their solicitors Leigh Day argued that the DWP had acted unlawfully by not making up a loss of £178 a month for TP specifically, when he changed over from his old benefits to Universal Credit. And the judge in part agreed. 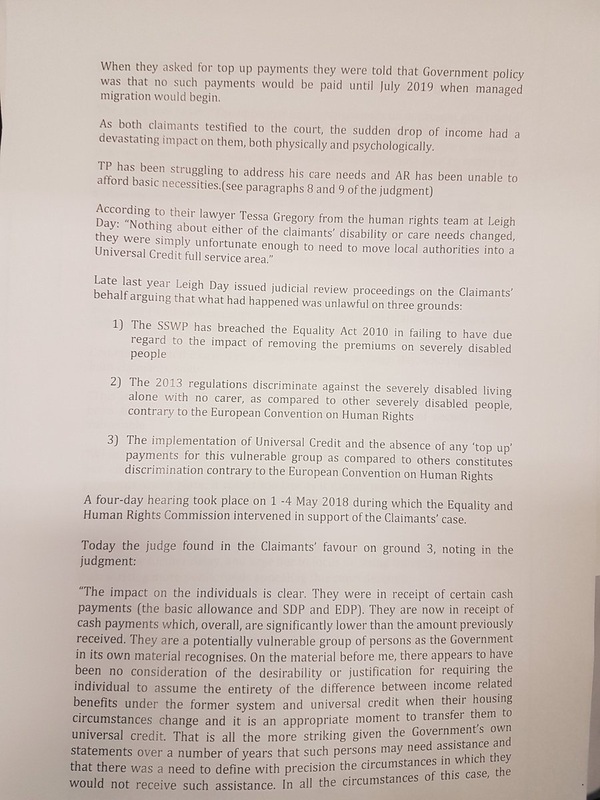 implementation of universal credit and the absence of any ‘top up’ payments for this vulnerable group as compared to others constitutes discrimination contrary to the European Convention on Human Rights [ECHR]. The implementing arrangements do at present give rise to unlawful discrimination contrary to article 14 ECHR… A declaration will be granted that there is unlawful discrimination. The defendant [the DWP] will then be able to determine how to rectify the unlawful discrimination. The judge dismissed Leigh Day’s two other claims against the government. But according to Inclusion London, he refused to let the DWP appeal the ruling. The court found in our favour on three of the four points raised by the claimant. We will be applying to appeal on the one point the court found against the Department. This Government is committed to ensuring a strong system of support is in place for vulnerable people who are unable to work. 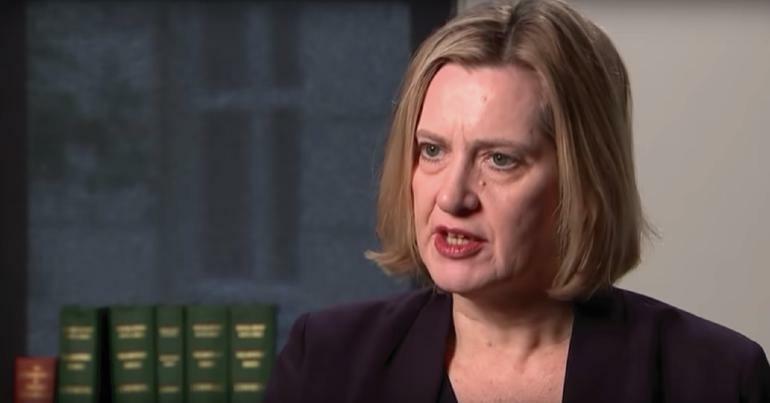 Last week, the Secretary of State announced that we will be providing greater support for severely disabled people as they move onto Universal Credit. And we have gone even further, by providing an additional payment to those who have already moved onto the benefit. The Canary first reported on the situation surrounding the benefits in question – Enhanced Disability Premiums (EDP) and Severe Disability Premiums (SDP) – in October 2017. These benefits currently give [pdf, p1] around 1.4 million disabled people with high support needs additional money. But under Universal Credit, neither [pdf p3-4] payment exists. Instead, claimants get different allowances depending on their circumstances. No one was going to have protection until Universal Credit digital is fully rolled out from July 2019. It only applied to existing claimants who have had no change of circumstance. None of this applies to new claimants, and people who had a change of circumstance. It is the latter that happened to TP and AR. As his solicitors Leigh Day noted, 52-year-old TP is terminally ill, living with non-Hodgkin’s lymphoma and Castleman’s disease. In November 2016, the DWP started paying him EDP and SDP. This was because he lived alone with no support. But on his doctors’ advice, he moved to London. Because he had a change of circumstance (his address), he had to make a new claim to the DWP. But the benefit was Universal Credit. Leigh Day claims TP then lost £178 a month because he no longer got EDP and SDP, and because the DWP did not provide any transitional protections. We believe that by taking away these essential benefits… the government has acted unlawfully. For my client… the additional benefits are quite literally a lifeline. At a time like this he should be focussing on his health not worrying about his benefits being axed… We believe the safety net… is being unlawfully eroded by the way Universal Credit is being introduced. Single people, over 25 and with no children could lose up to £2,137.20 a year. If a person is under 25, they could lose up to £2,929.68 a year. A couple over 25 with no children could lose up to £5,195 a year. What’s more, the DWP previously tried to pass the buck onto local councils by saying SDP was “care costs” to be picked up by the “social care system”. But as The Canary detailed, it is unlikely councils will do this. Importantly, those people who are moved onto Universal Credit will not see their benefit reduced. This, according to today’s judgement, is simply not the case. With 15,000 people who previously got either EDP, SDP, or both already having moved [pdf, p1] onto Universal Credit, the DWP has already had to review some these people’s claims; specifically those with SDP. 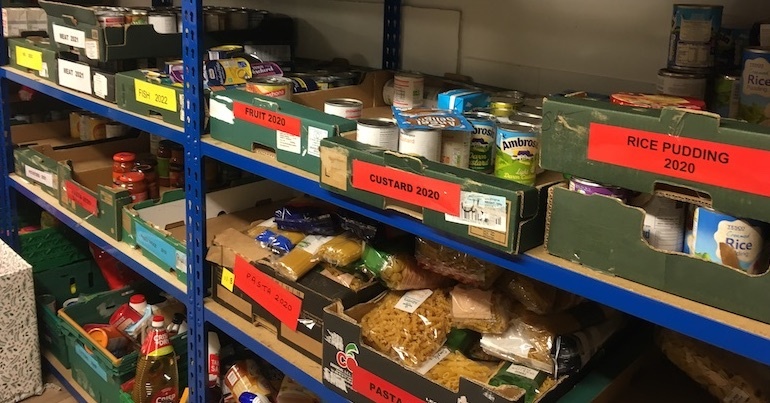 Now, with the judge ruling that the DWP’s previous policy was discriminatory and unlawful, it could open the floodgates for thousands more people to fight for compensation from the department. This article was updated at 2.40pm on Thursday 14 June to include a statement from the DWP.